Continuing my thoughts about how learning styles could affect people’s encounters with machines, I wanted to examine Suchman’s Planning and Situated Action (1987 and 2007) in an educational context. Curriculum as experienced by humans might have similarities that can help inform about interaction as experienced between individual and groups of humans and machines. Firstly, it appears learning style models have weaknesses. A review of 13 of the most influential learning style models (Coffield et al, 2004) highlights a lack of theoretical rigour, conceptual confusion and poor quality in learning style models, and an over-reliance on categorisation schemes. Attempts to categorise and then design pedagogy around these feels much more like planning, than planning with situated action. It underplays the idea that “lessons are always co-constructed by teacher and students together, through the unfolding actions and interactions” (Lemke, 1985). Coffield et al (2004) do not rule out the existence of learning styles; their primary concerns are with the research field, and use of learning styles to dictate interventions. Wells (2003) provides an early discussion of “situated enactment of learning and teaching” highlighting the non-deterministic nature of plans. Whilst undertaking recent team-based activities in our MRes Digital Civics modules, each person does not use a single consistent learning style. Instead it is more fluid – an improvisation based on the materials, objectives and most importantly the other participants – just like Suchman’s analysis (1987) of photocopier users when they try to help each other. These interactions vary session-to-session, and group-to-group. Fortunately, our combined group agency is not entirely pre-scripted and predictable. It is situated action influenced by our experiences, conventions, traditions, knowledge, collaborations, and of course the instructor and lesson plan. There are equivalences in the dynamics of (human-human) teacher-learner interaction with machine-human interaction – from an initial imbalance of understanding/knowledge, agency emerges during interpretation. The photocopier (Suchman, 1987) was trying to teach “users” its plan, and various interfaces, guides and handbooks were simply alternative methods of broadcasting a fixed plan to address different imagined learning styles. Furthermore, teachers and learners are not the same, and Suchman (1987) proposes that machines and humans are complementary rather than equivalent. The result (knowledge) again is not a fixed pre-determined outcome, but like Suchman’s flexible and moving “boundaries”, instead is something which is relational, situational and changes over time. The outcome of an interaction cannot simply be pre-planned, but needs to consider the context, and the interactions between all the participating parties at the time. Human learning styles should inform research in Human Computer Interaction (HCI). By considering the ways people approach and make sense of unfamiliar problems with other humans and technology, we reveal alternative approaches to how interpretation is encountered, working our way towards better solutions. In turn we can embrace some degree of ambiguity so digital technology is permitted to understand and facilitate people’s actions and circumstances, rather than pre-define these encounters. Learning styles are considerations in both planning and situated action. Jay L. Lemke. 1985. Using Language in the Classroom (Specialised curriculum: language & learning). Deakin University Press, Australia. ISBN 0730003086. Frank C. Coffield, David V. M. Moseley, Elaine Hall, Kathryn Ecclestone. 2004. Learning Styles and Pedagogy in Post‐16 Learning: Findings of a Systematic and Critical Review. Learning and Skills Research Centre, London. Lucy Suchman. 1987. Plans and Situated Actions: The Problem of Human–Machine Communication. Cambridge University Press. ISBN 0521337399. Lucy Suchman. 2007. Human-Machine Reconfigurations – Plans and Situated Actions. 2nd Edition. Cambridge University Press. ISBN: 052167588X. Gordon Wells. 2003. Lesson Plans and Situated Learning-and-Teaching. Journal of the Learning Sciences, 12:2, 265-272. Based on a radar chart and a set of indicators, Group Spinner allows teachers to record in-class observations as to different aspects of group learning and learning behaviors, beyond the limited knowledge acquisition measures. Reflection: the light-weight process of recording the observations using the indicators, transferring them to graphs and the ability to visualise development of students’ behaviour over sessions provides a powerful reflection tool for teachers about both their teaching and students’ development. Communication: the visual presentation is an effective tool to communicate positive or negative changes in learning and learning behaviours to the students. Planning: the ability to visualise changes in learning and learning behaviours across a number of sessions and for different student groups helps teachers in identifying students’ strengths and weaknesses and to plan future sessions accordingly. The current axes and set of indicators (rubric) for Group Spinner fits well with self-organized learning environment approach. However, it is still applicable to more general setting and even to settings where no technology is used. The next iteration of Group Spinner will allow users to customise, or create from scratch, their own set of axes and indicators (templates) to meet more general usage scenarios even beyond education such as health and sport. For more information please contact Ahmed Kharrufa, who also wrote this post. Self-Organised Learning Environments have revolutionised education by giving students control over their learning. Hanna Celina has taken this concept and applied it to online courses to creating Learning Circle. 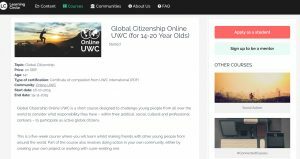 In partnership with United World Colleges, Learning Circle delivers five-week online courses for high school children around the world. The courses focus on activism and encourage students to take an active role in shaping the course, taking part in group discussions and working on projects together. Complex organisations such as schools cater well for the majority of their pupils, but those pupils who do not fit neatly into the organisational systems and structures may be neglected or need added support. Schools regularly collect and collate pupil performance and attendance data in an attempt to identify those not meeting normative standards. However those pupils with complex needs ‘get lost’ in this normative monitoring. Such pupils are those with special educational needs, or who are carers, or who are looked after. It is those whose needs sit outside of the majority who need the most specific individualised support, yet they are most likely to be ‘missed’ by a complex organisation. Innovative IT solutions may help to enable managers meet to the needs of all pupils in schools, even those often marginalised by organisational systems and structures. Oliver Harness, a School Improvement Advisor in Hartlepool, discusses the issues of support in schools, and opens a discussion about ways in which technology can help. After proposing an idea on the platform, students can encourage others to support their ideas. Following this the proposal goes into the Get Involved and Plan It phases, where supporters collaboratively discuss and design the event in more detail. Each of the ideas for educational events in the competition will be judged by the Library, Open Lab researchers and Chris Duddy, Education Officer at the Students’ Union. The student behind the winning idea will win £250, with runners up prizes of £150 and £100. The educational events could be anything from small study sessions to workshops and lectures. Each idea will be refined through EventMovement’s collaborative process, giving students control of the events. The winners of the competition will be announced in January. Full details about the competition can be found on the EventMovement website. For more information please contact Dan Lambton-Howard. LearningCircle.io is an online education platform, built with activism-focused courses in mind. These courses bring high school students from all over the world together in a five-week program. All of the course editions that we have done so far were done in partnership with United World Colleges. Our mission at Learning Circle I/O Ltd. is: “Learn, engage and create change with our online courses”. We provide the space for students and participants to learn from experts, from each other, and from the vast amount of information that is available, primarily on the internet. Having created fertile ground for learning, we then encourage students to engage with issues or subjects through undertaking regular assignments, which often involve real-world action. This helps to create change in the lives of students and those around them. Our online courses are usually civics-focused, meaning we help students from all walks of life build the skills and networks needed to tackle global problems, starting with their local communities. At the same time our students develop international and intercultural friendships through our interactive course format, where students meet face-to-face with other course participants via regular small group video conferences. Technology and innovation are at the core of our approach to education. Students learn how to access and analyse all available information, and learn to understand bias embedded in data. Assignments are designed to suit the different talents of the student community, allowing for creative expression using different media. We are inspired by the idea that education can be student-led. We want to encourage our course participants to identify their own interests and grow as independent thinkers. With our unique flexible curriculum and assignment structure students can design a course that best fits their learning objectives. This approach allows the students to develop skills that are crucial in today’s world: teamwork, creativity, independence and adaptability. On the Sunday of the preceding week students receive a reading and video list for the coming week. This is usually composed of newspaper articles and/or YouTube videos (such as TED talks) related to the week’s topic. On Wednesdays students receive a video lecture from an expert in the relevant field. Students can watch the lecture live and ask questions, or they can submit questions in advance and watch it later. On Thursdays students take part in a ‘group session’, a video conference with a group of around eight students. These group sessions are typically an hour long and usually also attended by a ‘mentor’. Mentors are volunteers, often former Learning Circle I/O Ltd. course participants, who have been trained to facilitate these group sessions, although students are encouraged to start taking a lead, by chairing meetings and taking notes. Depending on the course, some group sessions will not have a mentor, but will be self-organized. Instead, mentors will be on call as experts students can call upon to answer particular questions. Following the group session, students are set assignments which they have to complete, often in collaboration with their fellow course participants, over the weekend. These assignments can be anything from making a creative introduction to themselves for the rest of the students on the course to producing an infographic or video on a particular subject. Throughout the course we encourage students to get involved in their communities. Civic engagement of the students is at the heart of all our programmes; in most courses each student is encouraged to initiate and/or complete a community service project or social enterprise to apply the knowledge from our course. For more information please contact Hanna Celina. Hanna also presented her work as a Lab Talk.